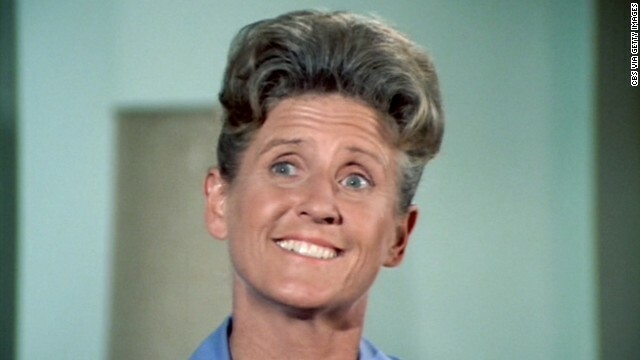 On this, the occasion of the death of actress Ann B. Davis, who played housekeeper Alice on The Brady Bunch, I would just like to say: I would have watched a spinoff that explored Alice’s inner world. I would probably have liked it better than The Brady Bunch. Alice was so much more intriguing than those milquetoast Bradys—stuck in that sky-blue maid’s uniform all the time, dating Sam the Butcher interminably. Why did she wear that uniform? Did the Bradys have a secret totalitarian streak they kept hidden from the sitcom cameras? Or, more likely, did Alice choose it herself to show her professionalism and/or to create a kind of personal brand? Meanwhile, she and Sam clearly had one of the best, most stable, long-term adult relationships ever seen on television, unique for non-married, middle-aged, working-class people. I would love to know what they fought about, how they resolved their conflicts, how they kept the magic alive. I bet they could have taught us all a lot. Gosh I want to see whatever it is that may have required Alice to risk death for a Brady. Now that Davis is gone, alas, we’ll never know. To Masters’ Degree in Journalism, or Not to Masters’ Degree in Journalism? RIP Ann B. Davis. You were great as Alice, and indeed I would certainly rather they had expanded your role than bring in cousin Oliver.